The war for Avantia has reached its terrifying conclusion! Tanner, Gwen, Castor, and Rufus have collected three pieces of the ancient mask that bestows the power to control all of Avantia's Beasts to the wearer. Only one final portion remains and it is being held in Derthsin's fiery volcanic lair. As the group travels toward the furious showdown, Tanner is plagued by the desire to put on the powerful Mask of Anoret. His struggle is amplified by the constant arguing between his friends. Only a united front of these four warriors and their powerful Beasts will be strong enough to defeat Derthsin and his army. 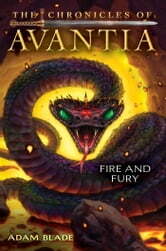 The fate of all of Avantia is at stake and Tanner is determined to see that all of their sacrifice has not been in vain. But an unsettling premonition has been following Tanner's progress and the losses may have just begun.